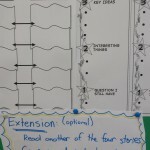 Over the next week, we will be following the reading process outlined in the images below. Use this as a guide as you read your allocated novels. 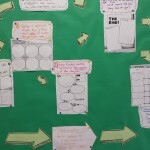 The whole process – sorry if it is a bit confusing! 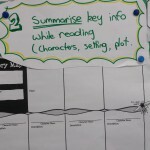 Step 2 – summarise key information about the characters, setting and plot as you read through the novel. 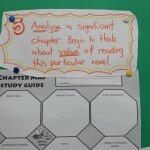 Step 3 – Analyse a significant chapter with your reading group. Look at elements such as theme and style and consider what about this novel makes it worth reading. 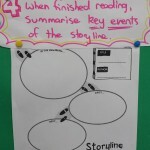 Step 4 – When you finish the novel, give a brief summary of the major events that occurred. 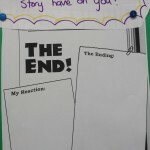 Step 5 – Describe the ending and your emotional reaction to it. 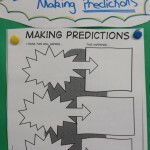 Step 6 – Go back and confirm your predictions. 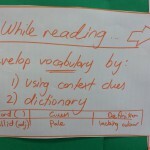 While reading – don’t forget to keep developing your vocabulary. Fill out the vocab charts in your notebooks. 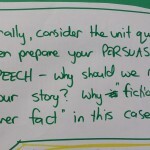 Use context clues to figure out the meaning of unfamiliar words first. Step 7 – Now you are ready to start the project. Why should others read your book? Where is the value in it as realistic ficiton? Extension – read another book and compare and contrast it with your own. No idea? 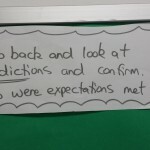 Well, before we started reading ‘Skellig’ by David Almond, Grade 8 students attempted to make some connections as a way of predicting what this novel would be about. Now, as we are reading the novel, we are starting to notice some of these symbols popping up quite frequently. What do they mean? Why did David Almond decide to put these things into his book? If you happen to notice other symbols or motifs as we read, make a comment below!